In 2002, the SMARTlab was awarded a highly competitive new EC grant for CULTURE 2002, bringing the codeZebra animal queendom to the UK and EC for the year 2002-03. The Culture phase of the project wound up in March 2003, and progress/performances and streams went live at the DEAF Festival, Rotterdam. codeZebra sought to build a cross-media dialogue generation and analysis software machine that is both synchronous and asynchronous; networked but viable on location. The codeZebra platform is a critical moderator’s tool that enables the mapping and mining of data. 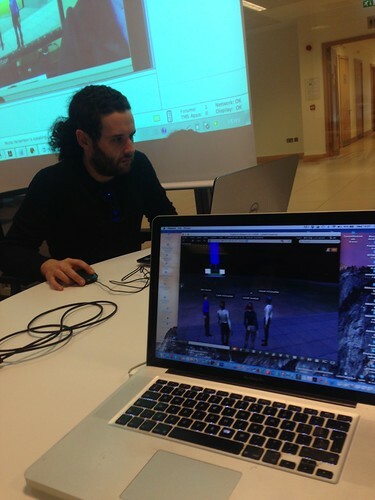 The project employed live clubs and streamed performances on an international scale, including real-time fabric generation and wearable technology games, and creation of personalised 3D and 2D visualisation patterns and monikers for users moving in the real performance spaces and the online chat rooms.